New Mexico has a Valley of Fires Recreation Area, containing a large expanse of black, twisted lava deposits set amongst barren land in the center of the state. 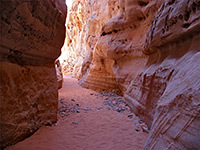 The similarly named park near Overton, 30 miles northeast of Las Vegas in Nevada offers a stark contrast - here, red is the dominant color, next to large expanses of contrasting pale yellow rock, both part of an undulating landscape of petrified dunes, strangely-shaped boulders and sheer sandstone cliffs set amongst an empty, very scenic region near the north end of Lake Mead; the drive to the area from the south (state road NV 167) passes buckled, layered cliffs and desert basins, often quite colorful, and has occasional views over the blue waters of Lake Mead to the east, but the valley is the most unusual place in the area. It is one of the most photogenic locations in the Southwest, especially at sunset when the rocks glow deep red and do indeed seem to be ablaze when seen from a distance. The landscape is made more striking by the surrounding black hills of somber appearance. The approach to Valley of Fire State Park from the north is along straight roads across the wide valley of the Muddy River, through Logandale then Overton, which is a small town but one that has all necessary facilities. 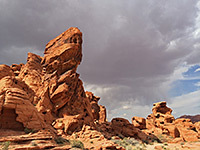 Access from the west starts at I-15 exit 75, from where NV 169 (Valley of Fire Road) crosses a vast desert plain for 7 miles then winds through a range of low, arid hills to the park entrance. Just before the hills, a track leaves to the south and leads to some old gravel piles and scattered concrete relics after half a mile, a place that makes a perfect (if rather lonely) place to camp - in sight of the distant interstate but many miles from any settlement. East of the state park, the nearest free camping is along side tracks leading into dusty hills a few miles south of Overton. All through traffic along NV 169 has to pay a fee to cross the state park ($10 in 2019), yet still the highway can become quite busy in summer, and forms part of a scenic diversion between Las Vegas and I-15 to the north - the journey involves an extra 55 miles, but is much more interesting than the interstate, which passes rather barren land between Las Vegas and the Arizona border. Map of Valley of Fire State Park. 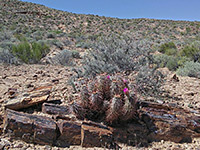 The nearest towns with hotels close to Valley of Fire State Park are Mesquite (50 miles) and North Las Vegas (43 miles). 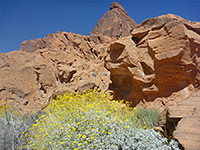 Driving to the Valley of Fire from east or west is equally scenic. 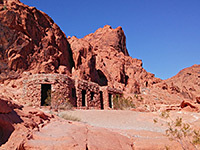 Although red rocks are exposed at scattered locations all over the desert adjoining the west side of Lake Mead, the state park boundaries enclose the most interesting formations, found along 10 miles of the highway and extending over 30 miles to the north, over a large area of mostly trackless land almost as far as Glendale, at exit 90 of the interstate. The exposed rock responsible for the dramatic colors and formations is Aztec sandstone, formed by petrifaction of ancient sand dunes during the Jurassic era (ca. 160 million years ago). The park has a good visitor center near the west entrance, with a few interesting cacti outside, although it seems rather large and well staffed for this relatively small park. 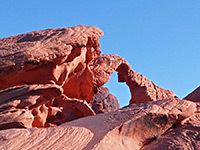 There are various viewpoints and named features along the main road (NV 169), including several short foot paths, and arguably even better scenery along the 6 mile scenic drive (White Domes Road) which forks northwards by the visitor center; along here are found more viewpoints and the most popular trails, plus rocks in a range of other colors besides red. - these weathered, layered sandstone mounds were originally sand dunes in an ancient desert, but are now preserved in stone. 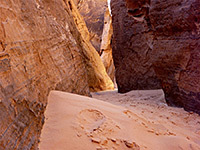 A short path winds through the rocky dunes, beyond which are empty desert plains, with dark hills in the distance, part of the barren Muddy Mountains. Nearby are three group campgrounds (each accommodating up to 50 people), useable only by advance reservation. - a large but somewhat isolated group of red rocks provides a striking backdrop to the main campsite in the state park; the other is a short distance away at Arch Rock. Together these total 73 sites (some with hookups). 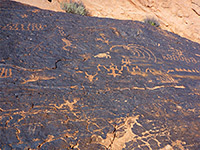 Ancient petroglyphs can be found at many places amongst the rocks, and even for those not staying overnight, the 2 mile road past the campgrounds makes for a scenic diversion. - the logs are several colorful fossilized tree trunks lying close to the road, safely fenced off to deter souvenir hunters. A 0.3 mile loop trail continues to other logs, while even more may be seen on ranger-led hikes into the surrounding hills. - a group of tall, red, eroded boulders surrounded by sandy desert provides a nice setting for a roadside picnic area, with tables and chairs - a perfect place for children to play hide and seek. - three CCC-constructed stone cabins were built at the base of high red cliffs during the 1930s, and now form a backdrop for one of two picnic areas along the highway. - this small but intricately shaped rock really does look like an elephant, and as it is close to the east entrance, many people get to take its photograph. The rock is actually right next to the road, but as parking is limited along this stretch of the highway, visitors have to take a 1/3 mile trail to reach the formation, starting at the main parking area by the entrance station. Also beginning here is a rather longer loop trail through the red rocks north of the highway.